Welcome to Day #2 of South American Chocolate Theme Week. One can't talk about origin chocolates of South America without mentioning Venezuela. 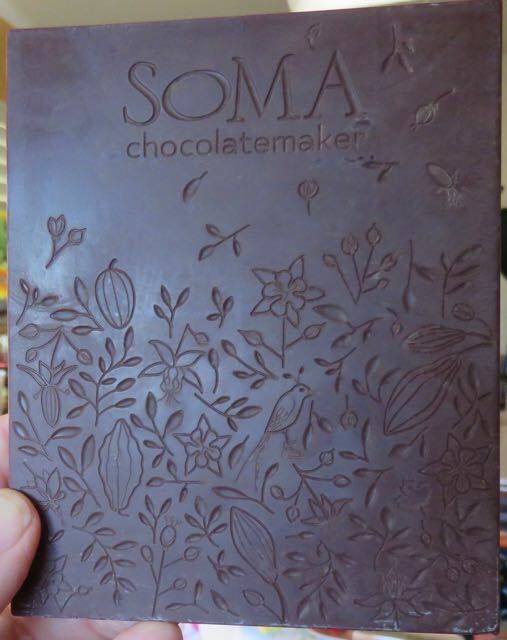 Today's two 70% cacao dark bars from SOMA Chocolatemaker (Toronto, ON, Canada) were both made with Venezuelan grown cacao bean, organic cane sugar, and cocoa butter. That's it. Nothing else. The unadulterated full bean experience. 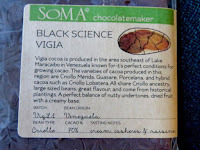 The SOMA Black Science Vigia 70% bar (Batch VigL1) is also perfect title for Halloween week, no? Deep, dark and a little mysterious, the cacao for this bar was produced in an area southeast of Lake Maracaibo* in Venezuela known for excellent Criollo beans (Criollo Merida, Guasare, Porcelana and as well as experimental Criollo hybrids). These Criollo heritage beans are known for their subtle, beautiful full flavor. 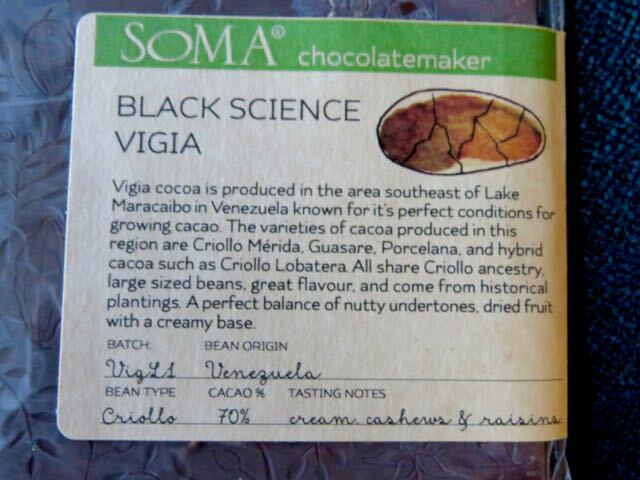 Today's Black Science Vigia 70% bar had subtle green, dried fruit (light raisin), very mild nuttiness (cashew) and light, creamy cafe latte aroma and flavor notes. I enjoyed a similar Vigia 70% bar from SOMA back in 2013 (Batch EV2). Both were very good. 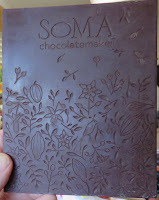 The SOMA Porcelana 70% bar (Batch PorL3) tasting notes read as follows: "cream, cashews, coconut, molasses." This bar was also made with Venezuelan cacao grown near (south of) Lake Maracaibo* in NW Venezuela. It was a great bar. Naturally sweet, well balanced, subtle and full of flavors that harmonized incredibly well together. There was no sharpness or bitterness to be found. This bar was a World Gold International Chocolate Awards 2015 winner. 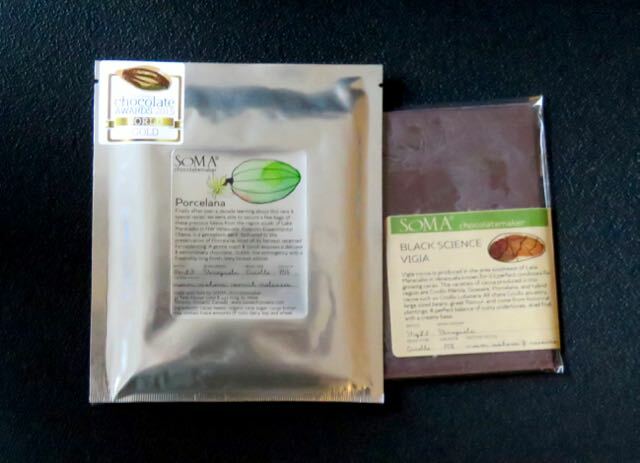 Both SOMA bars were worth searching out and trying. I love the pattern stamped on their bars. Look closely and you'll see, amidst leaves, cacao pods and flowers, a bird with a tennis shoe and a maple leaf (Canadian reference in the jungle). *Lake Maracaibo has always fascinated me. It is a large teardrop-shaped brackish tidal bay/estuary (that once was the largest lake in South America), surrounded by jungle forests, villages, rain and lightning—lots and lots of lightning.